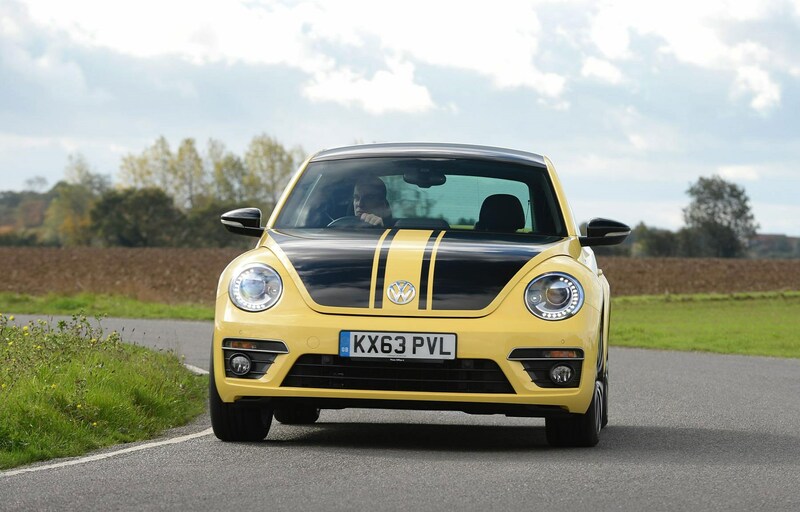 VW Beetle: the slammed, sportier Golf? VW Beetle information: everything you need to know if you own it, are thinking of buying one or just want to find out more about this retro-flavoured VeeDub. Click on the links below for all of CAR magazine’s news, reviews, videos, scoops and spy photos of the Volkswagen Beetle car range. VW’s second stab at a reimagined Beetle, it offers a bigger boot, more interior space and a more assured drive this time around. Much of the car’s hardware is shared with the pre-MQB Mk6 Golf. Engine range includes 1.6 diesel and a spread of petrols culminating in the surprisingly racy 2.0 TSI, dipping under eight seconds to 62mph with an Audi-style pre-programmed crackle on upshifts. While there is more space inside than the previous ‘new’ Beetle, tall rear passengers might still feel a bit cramped. Convertible version makes a good fist of things, with better refinement than the Golf drop-top, but you can’t see much out the back when the roof’s up. An improbable hot version was launched in 2014 called the Beetle GSR, limited to 100 examples in the UK. The GSR. What is the point? VW ups power of hottest Beetle: special edition ahoy! VW Beetle: the slammed, sportier Golf? The second-gen 'new' Beetle is less effeminate than before Less rotund, more squared-off than earlier Beetles More up-to-date infotainment in new VW Beetle cabin Beetle Cabriolet offers soft-top thrills VW Beetle convertible with roof up VW Beetle VW Beetle Dune concept car: the next Bug?